Detection of Mouse anti Bovine CD4 (MCA834GA) in an immunohistochemical analysis on acetone-fixed frozen bovine thymus using the Histar detection system (STAR3000), original magnification x60. Mouse anti Bovine CD4 antibody, clone CC30 used to demonstrate the presence of T helper cells in ovine placenta during gestation by immunohistochemistry on cryostat sections. Comparison of the immunohistochemical labelling of T inflammatory cells and parasite antigen in the placenta. This panel compares the distribution and frequency of T lymphocytes (CD3, CD4 and CD8 antigens) and parasite antigen immunohistochemically labelled in samples from the three groups. Pictures showing the labelling of T cells (first three rows) were taken at 75× and those of the parasite antigen (last row) were taken at 150×. F: foetal mesenchyme, M: maternal endometrial stalk. From: Arranz-Solís D, Benavides J, Regidor-Cerrillo J, Horcajo P, Castaño P, Del Carmen Ferreras M, Jiménez-Pelayo L, Collantes-Fernández E, Ferre I, Hemphill A, Pérez V, Ortega-Mora LM. Systemic and local immune responses in sheep after Neospora caninum experimental infection at early, mid and late gestation. Vet Res. 2016 Jan 6;47(1):2. Mouse anti Bovine CD4 antibody, clone CC30 used for the detection of CD4+ve helper T cells by immunohistochemistry on formalin fixed, paraffin embedded placental sections. Examples of different immune cell infiltration in placentomes from N. caninum-inoculated animals. (a) Severe infiltration of macrophages in the base of maternal caruncle of a N. caninum inoculated cow culled 14 dpi. Counterstained with haematoxylin. Original magnification 100×. (b) Mild aggregate of T helper cells (CD4+) surrounding a blood vessel in maternal caruncle of a placentome collected from an inoculated cow culled 28 dpi. Counterstained with haematoxylin. Original magnification 200×. (c) Minimal infiltration of cytotoxic T-cells (CD8+) in a necrotic focus in maternal caruncle of a N. caninum challenged cow culled 28 dpi. Counterstained with haematoxylin. Original magnification 200×. (d) Mild aggregate of γδ T-cells in the base of maternal caruncle of an inoculated cow culled 14 dpi. Counterstained with haematoxylin. Original magnification 200×. (e) Rare presence of NK-cells in connective tissue in the maternal caruncle surrounding necrotic and mineralized foetal villi, observed in a placenta of an inoculated cow culled 28 dpi. Counterstained with haematoxylin. Original magnification 200×. (f) Rare presence of CD79αcy+ cells aligned with endometrial epithelial cells in the maternal caruncle and in some foetal villi, observed in the placentome of a N. caninum inoculated cow culled 28 dpi. Original magnification 400×. Counterstained with haematoxylin. 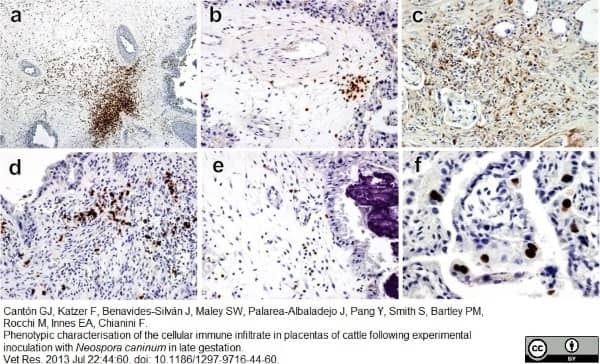 From: Cantón GJ, Katzer F, Benavides-Silván J, Maley SW, Palarea-Albaladejo J, Pang Y, Smith S, Bartley PM, Rocchi M, Innes EA, Chianini F.
Phenotypic characterisation of the cellular immune infiltrate in placentas of cattle following experimental inoculation with Neospora caninum in late gestation. Vet Res. 2013 Jul 22;44:60. Mouse anti Bovine CD4 antibody, clone CC63 (MCA834GA) used for the identification of CD4 expressing lymphocytes in bovine tissue sections by immunohistochemistry on formalin fixed, paraffin sections. 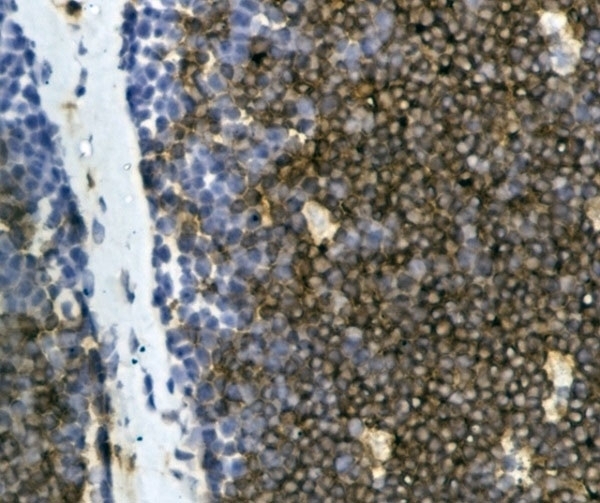 Immunohistochemical staining of CD4 + T cells of the Bovine mammary tissue using paraffin-embedded sections (A–C): (A) Showing the low immunoreactivity of T lymphocytes (arrow) in the interlobular connective tissue with the monoclonal antibody specific for CD4+ T cells in Bovine mammary tissue infected with BPIV-3. 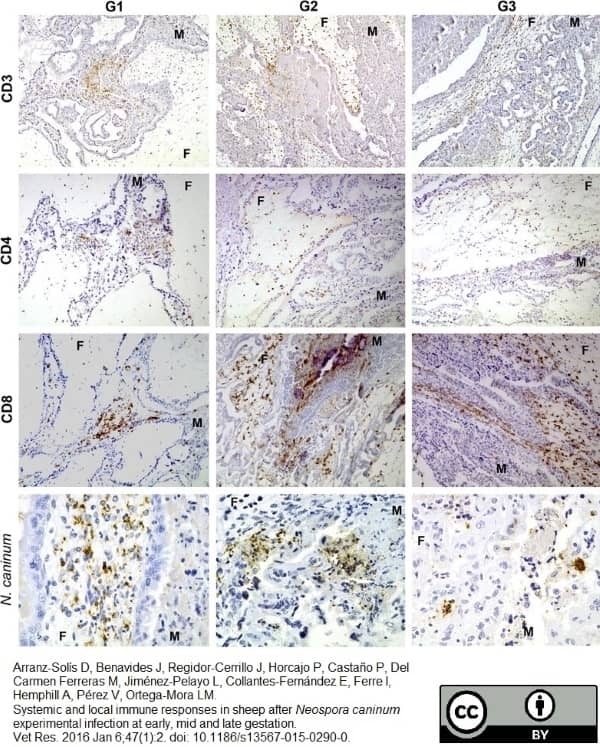 (B) The intermediate immunoreactivity of CD4 + T cells (arrow) in the interalveolar connective tissue with the monoclonal antibody specific for CD4+ T cells in Bovine mammary tissue infected with BoHV-1. (C) The high reactivity distributional of CD4 + T lymphocytes (arrow) in the interalveolar connective tissue with the monoclonal antibody specific for CD4+ T cells in Bovine mammary tissue infected with BoHV-1 and BPIV-3. IHC. Bar, 20μm. Mouse anti Bovine CD4 antibody, clone CC30 recognizes a ~50 kDa transmembrane molecule considered to be the bovine homologue of human CD4. The phenotype, tissue distribution and function of T-cells expressing the bovine CD4 antigen are similar to those in other species. However, expression on macrophages has not yet been detected. Mouse anti Bovine CD4, clone CC30 has successfully been used for immunohistochemical localization of CD4 on paraffin embedded material using zinc salt fixation (Cantón et al. 2013). Additionally, clone CC30 has been reported as being suitable for use on formal dichromate (FD5) fixed paraffin embedded tissue with amplification and antigen retrieval techniques (Gutierrez et al. 1999). Clone CC30 has been reported as being suitable for use on formal dichromate (FD5) fixed paraffin embedded tissue with amplification and antigen retrieval techniques, see Gutierrez et al. for details. Bensaid, A. & Hadam, M. (1991) Individual antigens of cattle. Bovine CD4 (BoCD4). Vet Immunol Immunopathol. 27 (1-3): 51-4. Eskra, L. et al. (1991) Effect of monoclonal antibodies on in vitro function of T-cell subsets. Vet Immunol Immunopathol. 27 (1-3): 215-22. Collins, R.A. et al. (1999) Bovine interleukin-12 and modulation of IFNgamma production. Vet Immunol Immunopathol. 68: 193-207. Sühwold, A. et al. (2010) T cell reactions of Eimeria bovis primary and challenge-infected calves. Rhodes, S.G. et al. (2000) Bovine tuberculosis: immune responses in the peripheral blood and at the site of active disease. Machugh, N.D. et al. (1997) Identification of two distinct subsets of bovine gamma delta T cells with unique cell surface phenotype and tissue distribution. J Gen Virol. 80: 663-9. Rhodes, S.G. et al. (2001) Antigen recognition and immunomodulation by gamma delta T cells in bovine tuberculosis. Knowles, G. et al. (1996) Phenotypical characterization of lymphocytes infiltrating regressing papillomas. Smyth, A.J. et al. (2001) In vitro responsiveness of gammadelta T cells from Mycobacterium bovis-infected cattle to mycobacterial antigens: predominant involvement of WC1(+) cells. Hein, W.R. and Dudler, L. (1997) TCR gamma delta+ cells are prominent in normal bovine skin and express a diverse repertoire of antigen receptors. Juleff, N. et al. (2009) Foot-and-mouth disease virus can induce a specific and rapid CD4+ T-cell-independent neutralizing and isotype class-switched antibody response in naïve cattle. Hope, J.C. et al. (2005) Exposure to Mycobacterium avium induces low-level protection from Mycobacterium bovis infection but compromises diagnosis of disease in cattle. Clin Exp Immunol. 141: 432-9. Sopp, P. et al. (2006) Flow cytometric detection of gamma interferon can effectively discriminate Mycobacterium bovis BCG-vaccinated cattle from M. bovis-infected cattle. Clin Vaccine Immunol. 13: 1343-8. Sacchini, F. et al. (2011) A minor role of CD4+ T lymphocytes in the control of a primary infection of cattle with Mycoplasma mycoides subsp. mycoides. Skyberg, J.A. et al. (2011) Murine and bovine γδ T cells enhance innate immunity against Brucella abortus infections. Cantón, G.J. et al. (2013) Phenotypic characterisation of the cellular immune infiltrate in placentas of cattle following experimental inoculation with Neospora caninum in late gestation. Reid, E. et al. (2011) Bovine plasmacytoid dendritic cells are the major source of type I interferon in response to foot-and-mouth disease virus in vitro and in vivo. Arranz-Solís D et al. (2016) Systemic and local immune responses in sheep after Neospora caninum experimental infection at early, mid and late gestation. Vet Res. 47 (1): 2. Clapp, B. et al. (2011) DNA vaccination of bison to brucellar antigens elicits elevated antibody and IFN-γ responses. J Wildl Dis. 47 (3): 501-10. Salman S et al. (2013) Colostrum and milk selenium, antioxidative capacity and immune status of dairy cows fed sodium selenite or selenium yeast. Arch Anim Nutr. 67 (1): 48-61. Aranday-Cortes, E. et al. (2013) Upregulation of IL-17A, CXCL9 and CXCL10 in early-stage granulomas induced by Mycobacterium bovis in cattle. Transbound Emerg Dis. 60 (6): 525-37. Pirson, C. et al. (2015) Highly purified mycobacterial phosphatidylinositol mannosides drive cell-mediated responses and activate NKT cells in cattle. Clin Vaccine Immunol. 22 (2): 178-84. Fuertes, M. et al. (2015) Immunohistochemical study and mRNA cytokine profile of the local immune response in cattle naturally infected with Calicophoron daubneyi. Vet Parasitol. 214 (1-2): 178-83.